This pizza has become a family favorite. With having three kids and three very different likings on their cheeseburger, I make this pizza- bar style. The crust, ketchup/mustard mixture, beef and cheese are the base (much like a regular cheeseburger). 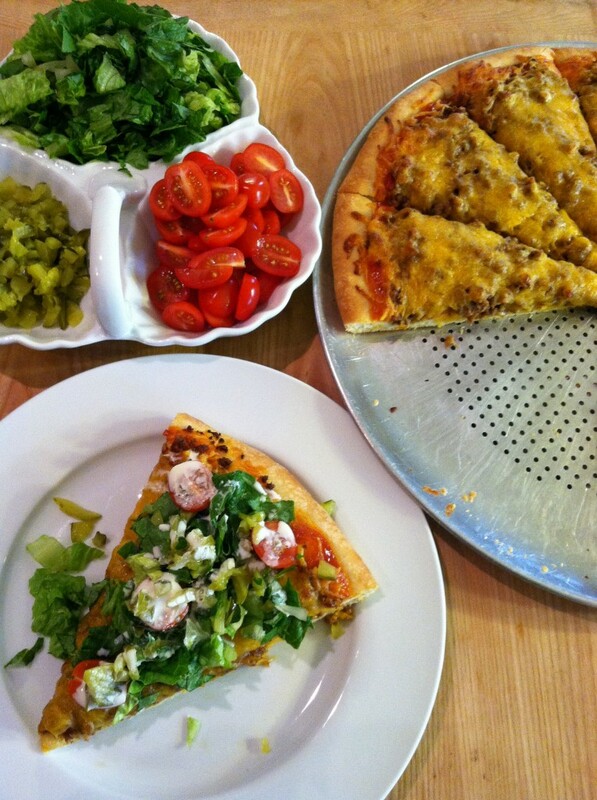 I put a variety of toppings in separate bowls and let everyone build their own cheeseburger pizza. The sauce is the real surprise. When reading the recipe for the first time, I was second guessing and re-reading several times, the mixing of pickle juice into mayonnaise. Really?! Ok! Why not? Mayonnaise by itself is bland but when you add the mouth puckering pickle juice (everyone’s tried pickle juice straight up, right?) the two condiments liquefy into the best condiment ever! Both children and adults are pleasantly satisfied with this pleasing combo. And everyone always looks at me crazy when I tell them what the sauce is. Who knew a little pickle juice could give such flare to each bite? 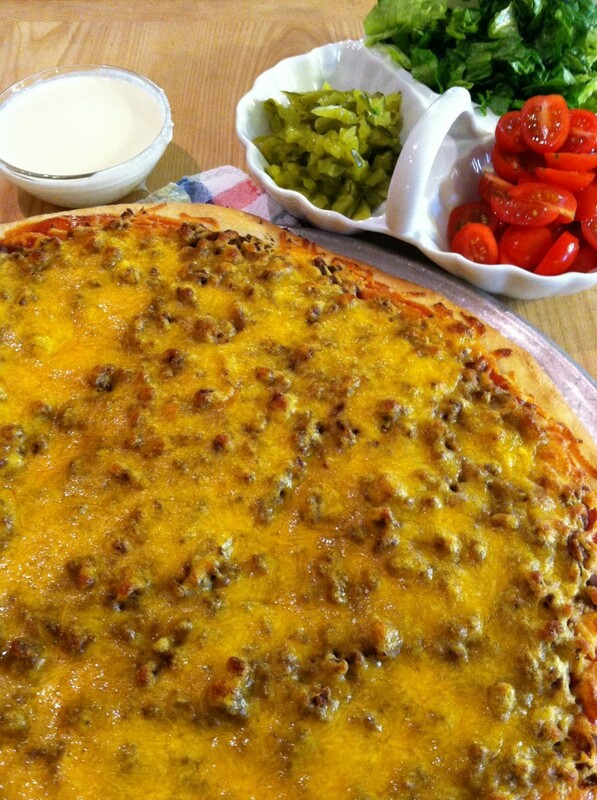 The original recipe was prepared by cutting the dough into four 7-inch circles; then topped with ketchup sauce, beef and shredded velvetta cheese. Having individuals would make a fun project at a child’s birthday party, but in my everyday life and busyness I opted to make into one big pizza. Create your own taste! Preheat oven to 500° . If using a baking stone, put the stone on the lowest rack. Prepare dough and cover until ready to use. Brown ground chuck in a skillet coated with nonstick spray over medium-high heat. Saute until cooked through, about 7 minutes; season with salt and pepper, then drain on a paper towel-lined plate. Whisk ketchup and mustard together in a small bowl; set aside. Combine lettuce, onion, tomatoes, and pickles in a bowl (or keep in individual bowls); whisk mayonnaise and pickle juice together in a separate bowl. Roll dough on a lightly floured surface into a 14-inch circle; place on a pizza pan lightly sprayed with cooking oil (can use a pizza peel or the back of a baking sheet coated with cornmeal if using a baking stone). Spread the ketchup mixture onto the dough, leaving a 1/2″ border. Brush edge of crust with oil and sprinkle with sesame seeds. Top sauce with ground beef and shredded cheese. Slide pizza from the peel onto the stone, and bake until cheese melts and edge begins to brown, 8-10 minutes; remove from oven. 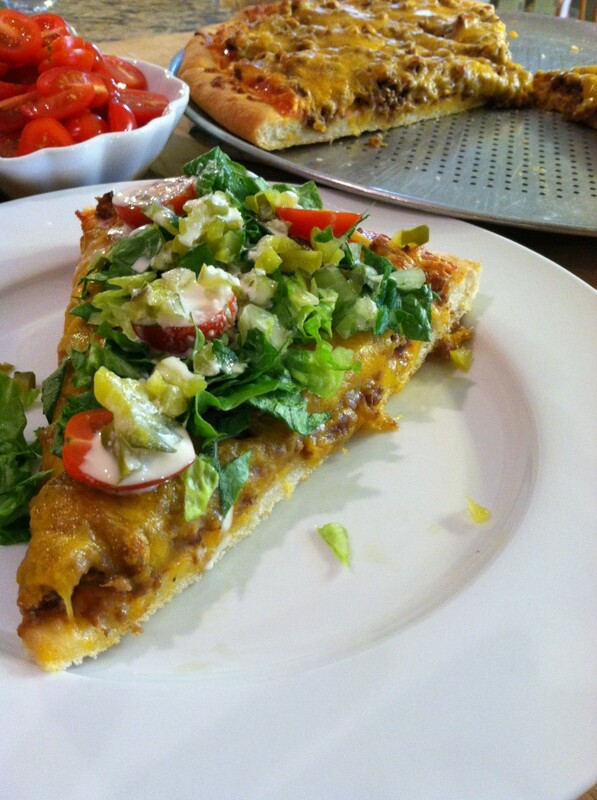 Top pizza with salad mixture and drizzle with mayonnaise sauce. Tip: If using a pizza pan; after the pizza is baking (about 8-10 minutes) it should be set enough to move. I take a long spatula and loosen it from the pan and slide it to the oven rack. By doing this it gives a crispness to the bottom crust. After a few minutes; move back onto the pizza pan and remove from oven.